Ambush Maneuver (Ambush Manoeuvre in Europe and Australia), or E-4, is the fourth mission of Treacherous Mansion in Luigi's Mansion: Dark Moon. This is the only boss mission in which the boss does not give a Dark Moon piece. Professor E. Gadd tells Luigi that he was able to hook up the Pixelator to the tiny camera found inside the miniature train model seen in the previous mission. The professor also says that the Parascope is detecting major paranormal signals in the Train Exhibit, where the train model was, and is almost certain that it is King Boo. He mentions that if Luigi surprises King Boo, Luigi will easily overpower him and be able to rescue Mario. After a bit of a pep talk, Luigi is pixelated to the train model. Inside the train model, there is nothing but a track, a large amount of balloons on the track, and, of course, the train itself. Luigi will notice that the front part of the train is missing, and if he shines his Dark-Light Device on it and defeats the Spirit Balls that fly out, the train starts, and plows through a bunch of balloons, thwarting the surprise assault. Suddenly, an unnamed Boo flies out of the train, taunts Luigi, and calls forth several more Boos. The Boos, 10 in total, combine, and says that while he is not the king himself, he is big enough to crush Luigi, and the battle commences. In battle, the giant Boo has two attacks; jumping into the air three times while attempting to crush Luigi, and going slightly underground, sticking its head out, and ramming into Luigi. If the Boo fails to attack Luigi while it jumps or rams into the train when attempting to ram into Luigi, it will be stunned, and will be able to be attacked. When sucking up its tongue, Luigi must aim for the large drill at the front of the train, and if successful, the Boo will "pop", and every single Boo will be stunned. Alternatively, when the Boo performs its ramming attack, when it aims for Luigi, Luigi may simply walk towards the drill, and if aimed correctly, the Boo will ram right into the drill, and automatically "pop" without Luigi having to aim again. 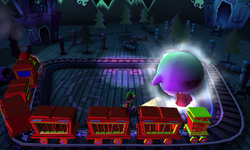 In this phase of the battle, Luigi must aim the Boos at the compartments inside the train; when aimed correctly, the Boo inside it will be unable to escape. After about a minute, the remaining Boos will combine once more and proceed to attack Luigi. Luigi must repeat his attacks until all 10 Boos are trapped in the train's compartments. After defeating the giant Boo, E. Gadd, obviously surprised, calls Luigi and tells him that was definitely not King Boo, and after a short conversation, he teleports Luigi back, and the mission ends. To get a 3-star ranking on this level, the player needs to beat the level within 3 minutes 20 seconds with no damage or within 1 minute 20 seconds with 20 damage. King Boo seems to be up to something inside the Train Exhibit. Ambush him while he's distracted. The miniature model in the Train Exhibit was a trick! Don't let Big Boo get the best of you. Ambush King Boo, and rescue Mario. The giant Boo that Luigi fights here is worth 10 Boos. The music that plays during the boss fight sounds a bit similar to the music that plays in Big Boo's Merry-go-Round in Super Mario 64, and is possibly a reference to it. Prior to completing the mission, it appears with the skull icon reserved for boss missions. After it is completed, though, the icon changes to read E-4. This page was last edited on July 13, 2018, at 11:34.